Johnny's Gone Fishing. 901 W Main St., Carrboro, NC The Station. 201 E Main St, Carrboro, NC Flyleaf Books. 752 M.L.K Jr Blvd ., Chapel Hill, NC Carrboro Century Center, 100 N Greens. Free and open to all! Come meet festival participants and other members of the community. October 17th-20th, 2018 will mark the 13th anniversary of the annual West End Poetry Festival in Carrboro, NC. Four days of poetry featuring more than 50 poets! There will be group discussions, a panel on Intersections, important readings, and amazing local food! All events are free and open to the public. 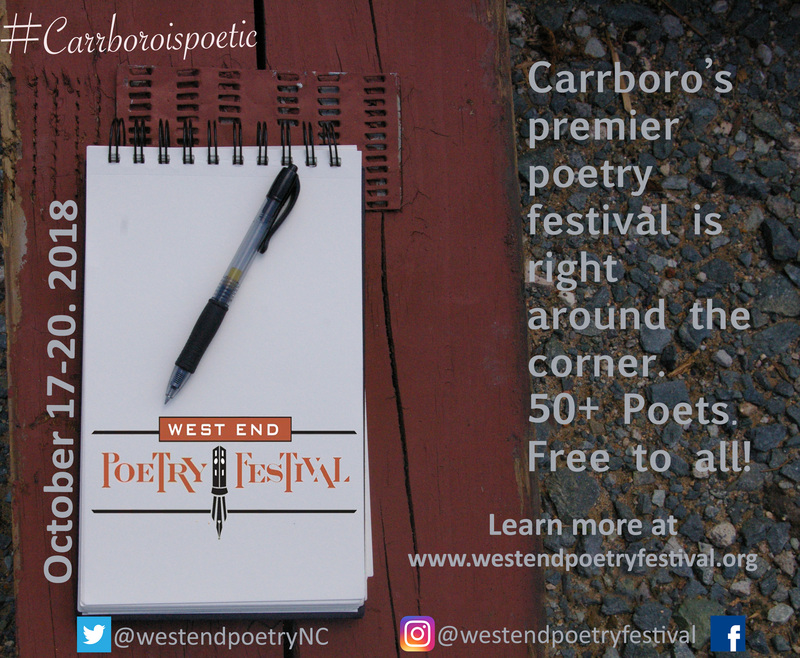 The West End Poetry Festival is sponsored by the Town of Carrboro.